In Sweden our traditional dishes usually go under the term “husmanskost” or just plain “husman”. Directly translated, the term means “house owner” and stems from how we described most of the classical every-day cuisine from the Swedish countryside. You might have heard of Smörgårdsbord, maybe even tasted some gravlax or pickled herring – all of these being different types of husmanskost. When visiting Sweden, you should really try some traditional husman and there’s no better place to do so than at the restaurant Nalle & Kroppkakan in Midsommarkransen. Kroppkakor is basically a Swedish version of potato-dumplings, stuffed with onions, bacon or pork, and served with melted butter and lingonberry jam. 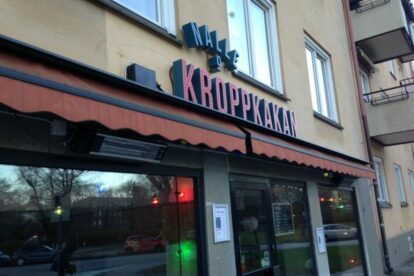 At Nalle & Kroppkakan they have taken this concept a step further and serve several variations of Kroppkakor, both with vegetarian filling and other meats than pork. If you’re not up for tasting a kroppkaka, rest assured, they serve other dishes as well. How about a yummy plate of Swedish meatballs with homemade mash or maybe a nice steak tartar, served with red onions, horseradish, dijon mustard and sourdough bread? I warmly recommend Nalle & Kroppkakan. The food is great, the staff is lovely and the portions are plentiful. A big plus is that the restaurant is located just by a park, so if it’s a nice summer night, you can walk out the door and peacefully digest your food in the dewy-moist grass.